This newly available one bedroom cottage provides a special retreat where you can enjoy your holiday in a relaxing environment. It is situated in Valleguerra, which is only 7 minutes drive from the natural pools of Bajamar and the fish restaurants of Punta del Hidalgo and just 20 minutes from Puerto de la Cruz and Santa Cruz. Valleguerra enjoys a pleasant coastal climate all year round. Built in 1785, the cottage has been tastefully restored to incorporate the character of the architecture as well as all modern conveniences. The accommodation consists of one double bedroom, an open plan living room/kitchen with television, kettle, electric coffee machine and toaster and shower room (hydro massage system). The kitchen is sufficient for cooking light meals, tea or pasta etc. 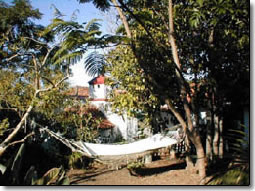 The patio and garden provide a wonderful spot for reading, eating breakfast or taking a comfortable nap in the hammock. Linen and towels are provided free of charge. A cot can also be provided if requested. There is also a portable electric heater available. There is garden furniture available on the large patio. 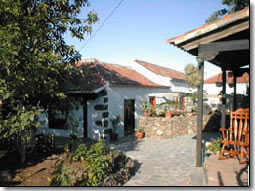 Recommended local restaurants include Casa Doris, Restaurante el Abogado, Restaurante La Milpa and Restaurante Los Olivios. A car is recommended. Local sports include walking, swimming and golfing. This price is for the property. Booking deposit for this property is 50% of the weekly rental, unless the booking is made less than 8 weeks before, in which case the full booking fee is payable at the time of booking.